It may be a cliché to call this a mid-life identity crisis, but at the ripe old age of 45 I suddenly find myself with an overwhelming desire to put an amusement park between my legs. What kind of amusement park? The wet kind with killer whales or the kind with G-forces, twists, turns and acceleration? Of course! I suddenly want to ride a motorcycle. Thirty years of car driving have not delivered banking, leaning and acceleration comparable to the forces available to a motorcyclist. The bike is the ultimate thrill ride that can go anywhere and deliver a tilting picture of the world flashing by. To ride is to become intimate with the air around you. The air becomes your aura, something that doesnt happen when you simply roll down the window in your Ford. And then there is self-image! Theres the image of spluttering around on an old Italian two-stroke scooter with a fifties style Italian beauty sitting sidesaddle on the back seat. Theres the image of a racing styled street bike with a rear mono-shock, dipping into the curves and prancing out into the straights. And of course theres the fat and noisy giant cruiser, gleaming in the sun and setting off all those useless car alarms. Why now? Why at 45? Well every boy likes his toys, and a quarter of a century ago I came pretty close to becoming a motorcyclist. But a deadly meeting between a close friends head and the asphalt and a visit to the motorcycle ward of the local hospital inspired me to retire to the metal shell of the motorcar for the rest of the century. But lately Ive been standing in the wind upon a 15MPH electric scooter, obeying bicycle laws and diligently calculating battery range and distances between two points. It occurs to me that with the proper training, the chances of getting injured in a motorcycle accident are no greater than the chances of being wiped out in the bike lane. Its time for a calculated and managed risk. With this in mind, I part with $200 and sign up for a 16 hour Basic Rider Course at the Motorcycle Training Center in North Hollywood, California, otherwise known as 1-800-CC-RIDER. Eight hours in a classroom and Eight hours on a small motorcycle in a huge college parking lot, guaranteed to greatly increase your chances of survival in the traffic, and also a way to waive the riding part of the DMV test that adds that magic letter M to your drivers license. They provide the bikes and the helmets; I bring the gloves, boots and eyewear. The instructions are clear. Boots must cover the anklebones; leather gloves must cover the wrists and there should be no bare skin showing on the legs or arms. Easy you say, just wear jeans and a leather jacket! Well its not that simple, 90-degree April temperatures in North Hollywood have led to the rules relaxing as far as upper body clothing goes. They let you ride the range in a sweatshirt. My first morning in a sweltering and stuffy classroom under the supervision of an instructor named Cary, is fun, aside from the heat. North Valley College is air conditioned, but apparently not on this day. On the way in I see the earlier students riding the range in their first and second on-bike classes. The bikes look reasonably new and everything looks like a fun game. In the classroom for the first of two four-hour sessions, I am relieved to note a slow pace of learning. The information exchanged in over four hours is the equivalent of say four minutes in an advanced physics lecture room. We are shown slow and amusing videos depicting talking bikes and bad actors, but its not all bad. There is a fairly well produced video section explaining leaning and controlling the machine. This first four-hour classroom session is really to prepare us for the written test the second week and also to prepare us for our bike time on the range early the second morning. The characters that make up my fellow students vary greatly in age, appearance and attitude. A young girl named Linda arrived late this first morning and having heeded the warning in our mailed reservations, proceeds to beg for forgiveness and permission to join. The instructor has clearly already decided to give her a break but she begs in such a lovely manner that watching this is a pleasure. 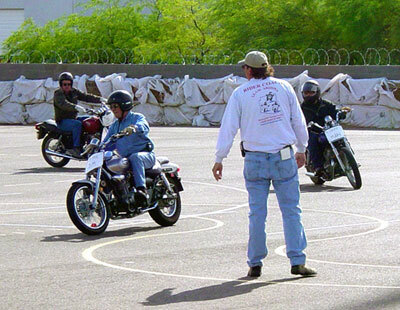 Our teacher teaches in the friendliest way possible and introduces us to basic principles such as the most critical differences between riding and car driving. The words stability and vulnerability sum it all up. We know riding motorcycles is potentially dangerous. Its about managing the risk to make it as safe as possible. Thats why we are here on the range instead of learning the hard way out there on the streets and highways. We learn that in the event of a mishap, which is a nice way of describing a potentially lethal and certainly painful accident, the proper gear can often prevent injury. We learn that knowing when and how to corner, swerve and brake can often help us to avoid collisions. From time to time Cary repeats something. He had pre-warned us at the start of the class that when he did this, it was a tip that we would be tested on the answer. From time to time a key point would be repeated three times, a sure clue that it would be on the test the following week. And then we get to ride our invisible bikes. In the classroom we are instructed on types of bikes, types of helmets, types of clothes and pre-ride checks of the motorcycles. We are taught to mount and dismount our invisible steeds and act it out en masse in the class. We are taught about braking, stopping, shifting up, shifting down, and the “friction zone” which is the point when the clutch begins to engage during the easing out of the left lever. We are told where we will usually find all the controls, levers, buttons, taps and stands on the average bike and what to do with them. Finally, Cary demonstrates the hand signals that our instructors will use to communicate with us tomorrow morning. And all this in 90 degree heat and no air. And then its the cool dark fog of the next morning. Sunday at 06:00 for an 06:30 start. The first thing that happens is they put you on sport bike and have you traverse a canyon at 100MPH. No really, after an inspection of your clothing to make sure you listened in class the day before, each student is assigned to a motorcycle according to size. The tallest guys got the dual-purpose trail bikes and the tiny Asian and Latina girls get the mini-cruisers with the low seats. I got a plain vanilla extra boring Honda 250. This was okay for my nervous reintroduction to riding after a 24-year gap since my last experimental attempt but I have to say that the handlebars were a bit low and it was later going to prove difficult to maintain the knuckles higher than wrist position that prevents the over-use of throttle. But then Ive always had wrists that dont bend up very far; I have to do push-ups with my fists because I cant put my palms flat on the floor. Now it is plain to see at this point of the course why the graduating students are able to reduce their chance of an accident by 90%. We are gradually introduced to safe control of a basic motorcycle, one slow step at a time. We go from finding the controls to walking the bike forwards and backwards to mounting and dismounting and then straddle walking the bike. The latter technique definitely puts the pressure on the men in the class and there is quite a lot of standing and adjusting of pants following each extended straddle walk. Next, each half of the class pushes the other half and releases them so that they coast across the range and brake to a stop. Almost riding now, we are taught to find the friction zone, that place in the release of the clutch where the engine begins to engage the drive train. Everything is introduced to us a step at a time and under full supervision for our own protection. Gradually, as the morning progresses, we get to ride the course in first gear and we get to stop many, many times. Its repetition that we need and better here than out on the street. It slowly begins to be second nature to start, shut down, mount, dismount, take off, stop and corner. Then we swerve through cones and ride in progressively smaller ovals, both clockwise and counter-clockwise, all accompanied by full explanations. Now I have to be honest, I run into some problems. It takes me a while to learn to apply my brakes smoothly. My Phat Flyer Electric Scooter is to blame for this. Braking on the Flyer requires a very hard and fast squeeze to have any effect. Thats not a good idea on a motorcycle! But the hardest thing for me is to get my right arm low enough to get it below the level of my knuckles. Consequently I tend to have a little too much throttle from time to time. Other than that, I am able to control my little bike very well. My biggest screw up is during an exercise towards the end of the day that involves stopping with the rear brake only and shifting down to first at the same time. My stopping distance is triple the expected and my revs are embarrassingly high. I get it right on the second attempt though. Some of my classmates are not doing so well. One of the charming tiny Asian girls falls off the bike a couple of times and eventually leaves the course to return for a second attempt at a future date. Another gentleman who is rather portly keeps stalling his bike. This is a guy who has already purchased a new Harley Davidson and is just dying to be able to ride the thing. On a slow tight turn that involves downshifting, braking, turning tightly with the clutch in, and then easing out the clutch and applying throttle to power out of the curve, I actually get a “perfect” comment from the strict military style instructor called John. This pleases me immensely. After four hours we have gone from being unable to hold up a machine to being in fairly good control of the same machine. The sun is out, it is beginning to get very hot, and we are all physically drained. The afternoon class is about to do what we had just done, in sweltering heat. Driving home in the insane flow of the busy freeway at 80MPH in my car I try to imagine myself being in the same spot on a motorcycle. No way man, I am not ready for that yet! A week later and we are back in the classroom. The air conditioning works today and there is yet another different instructor. Throughout the classroom portion of this course we follow the same format as the previous week but deal with more advanced topics in order to prepare us for the second day of riding. The videos seem a little less corny and the written test at the end seems very easy. I didnt stick around for the results but Im sure I scored close to 100%. The following morning we are back on the range for our second and last riding class, with our fifth and sixth new teachers. Todays class is very challenging. We stop straight with locked rear wheels, we weave through cones, and weave and steer through widely split cones. We straighten up and come to a short stop from a banked curve, and we swerve past an imaginary truck and stop alongside on command. We even ride a figure eight, calculating the gap in the traffic that is our fellow students. I had been allowed to ride a different bike on this day, thereby solving the too-low handlebars problem. Linda, the girl who arrived late for the first class, expressed trepidation at every stage, but then succeeded in executing each stage without a problem. Towards the end of the session, we are involved in exercises, which require us to go one at a time through the range. So here we are in traffic, in a long stationary line of bikes in the increasing valley heat, with our engines running and sickly exhaust gas filling our lungs and clothing. I am getting a headache. We take a break to fill out a customer satisfaction questionnaire. We rate our six instructors on various aspects of the job they have done and fill in suggestion boxes. I suggest repainting the lines and cleaning the cones for better contrast. I can barely see either. And then its test time. 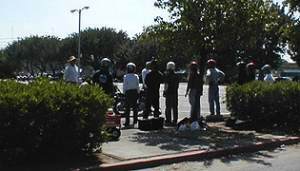 The instructors take off their nice friendly hats and put on their DMV strict hats. They tell us not to be nervous because we have to completely screw up and lose more than 20 points to fail the test. Linda says she is nervous and I feel nervous myself, even though at this point in the game, I have already made the decision that motorcycling is just not for me. There are just too many outside risks. We may have been taught control of the machine, we may have been taught how to scan, interpret, predict, decide and execute, and we may have increased our odds by being here for sixteen hours, but I have made this decision without even realizing it, until now. Test time. We line up in a line of eleven bikes. For the test we repeat a handful of the exercises we have done in the class. We have been told to relax. We know it will take a royal screw up to lose enough points to fail the test. Here we go. Weaving through cones. I did this before without a problem but now Im off course. I cant possibly turn enough to get to the left of the next cone so I slow. Too much! My foot goes down – automatic points loss. I still cant get back on the right line through so I just pass the cones and head for the corner. Exiting the corner, still bewildered, I cross the outside yellow line. I make a complete screw up of the test. There are two more tests, but its too late. We return our bikes to the grid for the second class to use and power off for the last time. The instructor calls me over. “Jeffrey”, he says. “Twenty-one points deducted.” I tell him I know. I completely messed up the first part. “You can take the test again.” He says. “Just call the office and come down at the end of a four hour class and see if you can get in to retake the test”. At this stage I really wish I had lost a couple less points so I could be done with it all, but I decide to wait for Monday morning to make a decision. I follow him over to the rest of the group. He tells them they all passed. I realize Im the only one who failed. Linda runs over and hugs the instructor and we all laugh at her display of exuberance. Two weeks later, my ten classmates will receive their certificates. They are to go and get their full licenses and practice what they have learned in as little traffic as possible until their confidence rises. I drive my car home and then go for a short ride on my electric scooter. Standing up in the breeze at 15MPH in the back alley it actually feels pretty fast, and quiet, and it doesnt smell. I shower, take a nap, go to my dance class and six hours after the rider course, my nostrils are still giving me carbon monoxide. No wonder I couldnt find those cones! Do I rebook the final test and get a letter M on my license or just walk away with sixteen hours of lifes experience under my belt? I still can’t decide. I don’t want to become a CC Rider, but it seems a shame to waste those sixteen hours. Jeffrey the Barak is the publisher, editor and designer of the-vu. He’s very good at driving a car. A well written post, I just given this onto a colleague who was doing alittle analysis on that. And he if truth be told purchased me breakfast because I discovered it for him .. so let me reword that: Thankx for the treat! but yeah Thnx for spending the time to speak regarding this, I feel strongly concerning it and enjoy reading a lot of on this topic. If attainable, as you become experience, would you mind updating your blog with a lot of info? it’s very helpful on behalf of me. 2 thumb up for this blog!